When your garage is due for an improvement, look no further than Custom Garage Works! We have been offering a variety of custom garage services such as garage floor coating in Joshua, TX since we first opened in 2003. We wanted to craft the perfect garage, and when we couldn’t find what we wanted in the industry, we made the decision to create it ourselves. 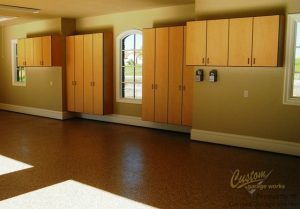 We now provide our clients some of the best custom garage solutions around, including high quality cabinets and incredibly durable floor coatings that out-preform epoxy coatings. Our contractors are professional trained, and we are passionate about creating custom garages, with superior garage floor coating results across DFW. Going up in popularity with each additional year, our garage floor coating in Joshua, TX is among the best you’ll find in DFW. This is because by using polyaspartic coatings in lieu of epoxy, we create a finish that lasts longer and performs better. Unlike epoxy that will yellow in the sun, and peel or flake over time, these coatings are stronger and more resilient. Since we only use a diamond grinder to prep the floor for coating, as opposed to acid etching, we can provide a higher quality end result. Give us a call at 214-494-9068 or 817-308-1305 for your free estimate today, and we can tell you more about our professional garage floor coating service. When you are running out of space in your garage, Custom Garage Works has the perfect garage storage and organization solution for your home! 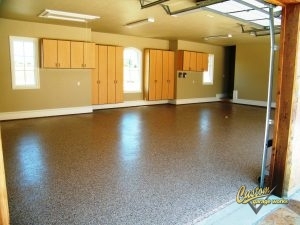 We know that a brand new garage floor looks greatest when it won’t be covered by other items in your garage. To address the unique organizational requirements of our clients, we offer a selection of different organization products, including overhead storage racks and cabinets. Designed specifically for garage use, our storage cabinets are among the best in the business, and our storage racks are designed for heavy duty storage. For a reliable garage floor coating in Joshua, TX that will last for years, and an organization solution that cannot be beat, you can rely on Custom Garage Works! Storage Cabinets These custom cabinets are unlike any other garage cabinets you will find in this area, thanks to their superior durability.